Do you remember somersaulting down hills as a child? Slowly you begin to gain speed and soon enough you lose sight of everything happening around you, seemingly lost in a whirlwind of fun, tossing and turning without any knowledge of current orientation or surroundings. Traveling from one foreign place to another can interpolate a very similar sensation of unconsciousness. This past weekend I traveled to the home of the world’s most illustrious spas and bath houses. Budapest, unbeknownst to myself prior, is home to much more than saunas and savory local cuisine. The people there are the true prize to be seen. They ooze a sense on self individualized confidence. Not only can you feel it in the instance when the eyes of the older Olaf-esk brute from the other side of the steam room is staring you down to your soul, but also, as you are received by the jaunty bartender who offers you his best beer on draught with a smile and a trusting gleam in his gaze. The city has been through quite a load over the past five centuries or so, (I challenge you to research that) and the stories are inscripted beautifully into stone and mortar in order to last generations. Moreover, the stories seen in the marble depicted scenes are of heroic ancestors and invading aliens; rather than victors and vanity, so that the true history of Budapest’s people will never be lost in time. 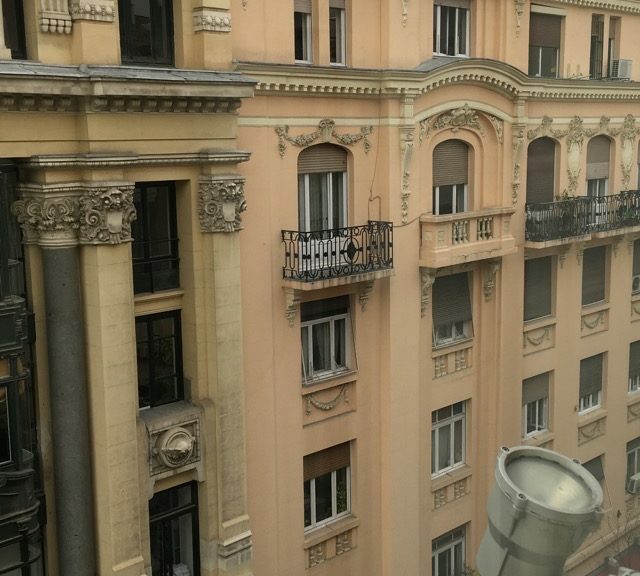 My experience, on the contrary, seemed to have fallen victim to my hurrying from monument to monument, church to castle, and bar to bath; though I was constantly entranced by the east/west median of European culture, never once could I feel the slowness of home in which every second seems indulge-able. Nay, I would not suggest that I am home sick, but rather, I would infer that I must take a lesson from the story of August on my next trip, and that is to hurry slowly. Festina Lente! 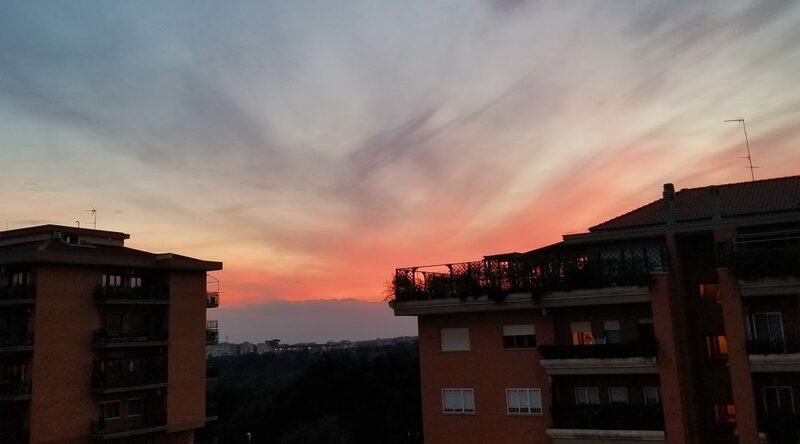 Its been three weeks as of today living in Italy. Its taken so much adjusting its crazy. I don’t think I’ve truly felt like I live in Italy until today. media sites by 20% by April. 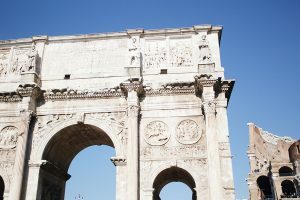 I don’t anticipate that being incredibly difficult since their sites are ideal for finding amazing spots all around Rome. The whole process of dressing business casual, taking the metro, drinking espresso, and working for a Rome based company makes me feel more local than a tourist the longer I’m here. Every Thursday, everyone in the office does Thirsty Thursday and has a glass of wine together to boost morale. It really takes the pressure off working throughout the week. My main task as of now is to create my own schedule to produce content to post in Instagram, Twitter, and Facebook throughout the week. I’m loving the creative freedom and the opportunity to produce unique content to help the company grow. w York. He studied abroad here as an International Studies major and just never left. Its been 15 years. 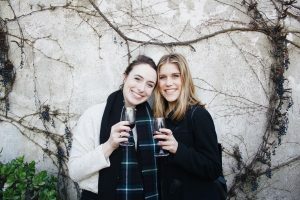 The most important part of living in Rome and adapting to this new lifestyle is getting into the community and forming meaningful relationships with the people you meet. I know that sounds cliche but its true and its the best part of living here. I want to bring Jesse back a Loyola flag to put on the wall with the rest of his university collection from people who’ve visited and loved it there. After, I began tutoring two Italian children in English. Pier is 7 and Niccolo is 5. Its only an hour and I learn 20 Euro for the hour I’m tutoring. I read them books, play games in english to build their vocabulary, and get them used to hearing English from a native speaker. Its tricky because they’re different ages and have different language competencies. I really enjoy it though. Getting into the community and helping out also makes feel like I’m part of it. Whoever is reading this, if you get the opportunity to tutor, take it. I’m worried I won’t want to go back home by April. I have been living in Rome now for 20 days, although it feels like 100 and 1 at the same time. Confusing? Good, because that is just the way Romans do it. The streets wind without pattern, clogged in one place with endless mopeds and taxis, sun-soaked and empty in another. The city moves and breathes, never waiting for you to get your bearings. 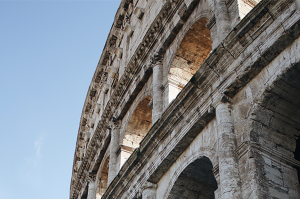 When you get to Rome, you have to hit the ground running. Once you do, it becomes easy to see why so many people have fallen in love with this city. In 20 days I have already had one of the best meals of my life at Osteria dell’ Anima in the city center. I have seen beauty both man-made and natural that I never knew existed outside of post cards. 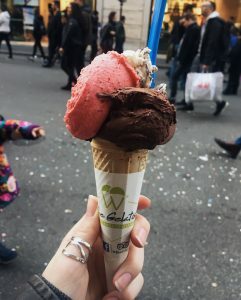 When I finally got my hands on some gelato at Giolitti, it lived up to all the hype. If these first days are any indication, this semester is going to be a wild ride. 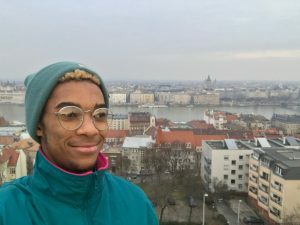 I want to use this blog as a way for others to see a sliver of Rome and Europe through my quick experience. Since I cannot hope to see, smell, hear, and feel all of Italy, or even Rome, I will focus sharing the most beautiful things I find here. Since it is important to be mindful, I will use this blog as a way to reflect on differences between here and Chicago, and what those differences teach me. 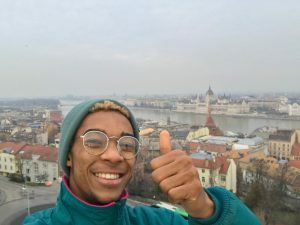 At the very least, I hope this can be a place where you can learn something about another part of the world, and scroll through some cool pictures. Grazie e benvenuto a Roma! Thanks and welcome to Rome! The little things seem insignificant yet define our everyday. Like the way the bus jolts or the cold humidity, which I’ve never experienced as a Chicagoian. Or enjoying my choice of three different flavors of gelato in one cone (flavor number one is always cioccolato). That moment of realization that I’m lost, but completely content. Dreading the uphill walk to get to class and making friends with the neighborhood cats. The warm feeling of sunshine coupled with the smell of espresso and fresh air. Awe at the grandeur of Roman art and architecture while weaving through the Saturday afternoon crowds congesting the small cobblestone streets in the city center. The feeling of accomplishment when I successfully navigate home from an adventure. 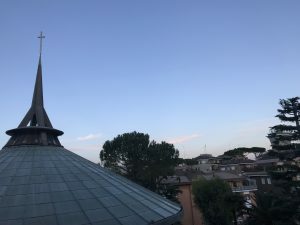 These are a few of the things that define my first three weeks in Rome, Italy at the John Felice Rome Center. These moments are mine and no one else’s. 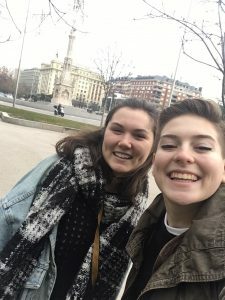 Before leaving Chicago to come to Rome, I wanted advice from anyone and everyone about being abroad but I’ve come to realize that everyone’s experience is unique. Moving to a new city has exposed me to the little things that I’ve become desensitized to in Chicago. I want to remember all the little things from every place I visit over the next three months, especially the gelato. 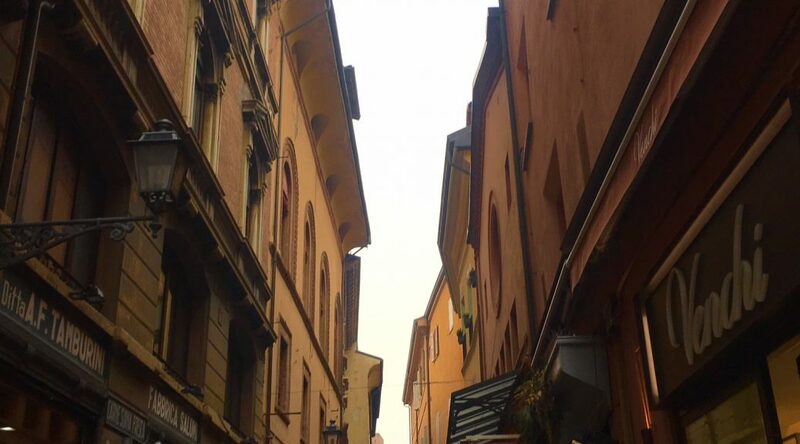 This weekend I’ll be exploring Florence, Italy, stay tuned for updates of my adventures! My time here in Vietnam is already flying by and this past week has been full of so many different experiences so buckle up! This week classes have settled in and I’ve gained a rhythm to the ebb and flow of Saigon. Tuesday night was one of the craziest nights here all because of football (aka soccer). In case you did not know, football is a huge deal in Vietnam. Tuesday night was the semi-finals for the U23 Vietnamese football team and when I say this was a big deal, I mean this was a big deal. Football is such an essential part to a lot of socializing and culture from what I have experienced, and the team won, making it to the finals. Now everybody remember when the Cubs won the world series? Imagine that reaction but ten times over. 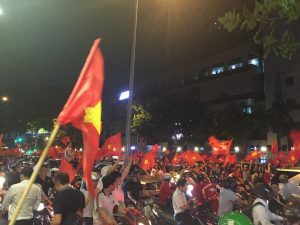 The streets filled with people waving their Vietnamese flags and chanting and cheering. I can say I have never experiences anything like it before. 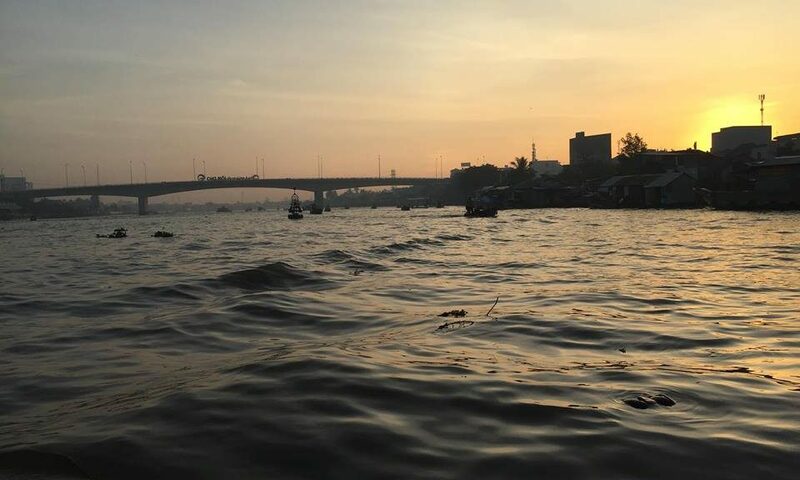 I ended up stuck in district one of Saigon and I live in district ten, so it did take a quite a while to get back, but it was worth the experience. I have never seen such pure joy and celebrations like that. In other exciting news, I finally rode a motorbike (with a helmet because duh)! As I mentioned in my last post, motorbikes are a vital part to transportation in Saigon and I have never ridden one before. The Vietnamese equivalent to Uber is an app called Grab which is exactly like Uber with motorbikes as well. I decided to try it out as riding the bus can get repetitive and I sure did make the right choice. There is nothing like riding on the back of a bike in the bustling streets of Saigon. Its almost scary but, mostly an adrenaline rush and I’m going to be riding a lot more while out here. 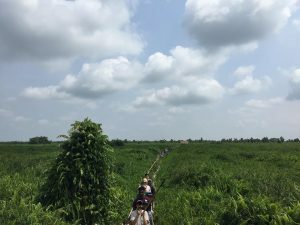 We also had our first excursion this weekend where we bussed to the Mekong Delta area of Vietnam. Southern Vietnam, specially the areas away from large cities, offer so many bright and lively experiences. 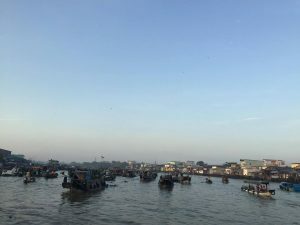 We woke up at 5am to go to the floating markets of Can Tho. Floating markets are exactly what they sound like, boats of people selling fresh produce, coffee, various fruit drinks and such. It was quite the view on the river seeing the sun rise and eating fresh pineapple in a boat. Shifting focus, we also discussed many important environmental factors affecting the Delta area as well as Vietnam as a whole. 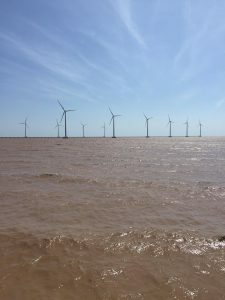 We visited a wind farm and got up close and personal with a wind turbine (spoiler alert: it was windy). 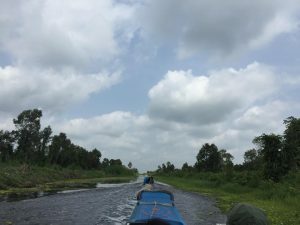 We also visited the U Minh Thuong national park and took another boat ride around the forest and saw monkeys, walked across a bamboo bridge, and avoided getting leeches from the water. 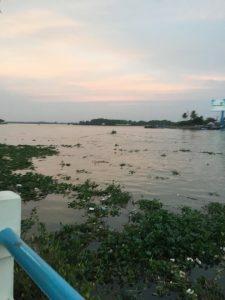 It was absolutely enlightening to be at the front end of a large issue of rising water levels, sustainable power, and the tender balance that needs to be made to create a positive change without negatively affecting another part of the environment. I feel like I have been here for longer than three weeks because I’ve experienced so much (even more than I was able to write about here!). It is breathtaking and amazing and many more adjectives and the more time I am here, the happier I am that I am spending my semester in Vietnam. that I’m temporarily not a part of. 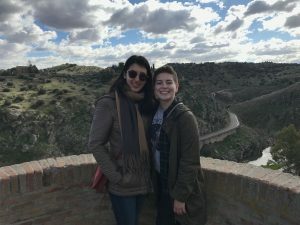 Studying abroad in Spain has been a dream of mine since I began studying Spanish and it is nearly impossible to wrap my mind around the fact that I am here, and that this is really happening. ‘The week leading up to my flight, I was incredibly nervous. I began to do what I do best: make lists. I made multiple comprehensive packing lists, detailing what I would be bringing and how it would be packed. The night before my flight, I sat in my roommate’s bed and cried, feeling overwhelmed and underprepared for this journey in front of me. Even in the moment I said goodbye to my dad in the airport, Spain was still just an idea rather than reality. I have been dreaming of this semester for so long, and it is finally happening, but it still doesn’t feel real. I have been in Madrid for three days now, and it feels like a dream. The first day I was here, I spent the morning and early afternoon aimlessly exploring the city with a new friend, Emma, simply taking in the sights of the city. We ended this excursion with a pitcher of sangria and a large plate of paella, a delicious Spanish rice dish (we learned from our director later that night that only the Americans order sangria, oops!). Here we are, as we explore the city! Visiting el museo del Prado was an incredible experience. I have been passionate about Spanish art since studying it in high school, and today I was able to see the obras maestras of Velázquez and Francisco de Goya– something I had been dreaming of. Las meninas by Velázquez literally took my breath away when I saw it. I was in awe– the painting was more beautiful than I could have ever imagined. The same thing happened when I saw el tres de mayo by Goya, pictures of the painting will never do it justice. For lunch yesterday, I had the best tacos of my life. 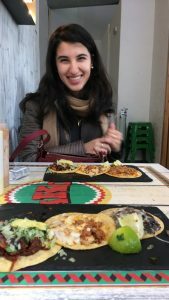 I know that tacos are definitely not Spanish food, but a friend told me that I needed to eat at Takos al Pastor, so Alyssa (another new friend!) and I went after the trip to the Prado. Those tacos honestly ruined all other tacos for me and I’m not even mad about it. For dessert, Alyssa and I went to a cute pastelería and got sweets: mine was called a pepito de crema! Today brought about new adventures: an excursion to Toledo (a city south of Madrid in the region Castilla la Mancha), lunch at the local market, and a visit to the Reina Sofía which is home to my favorite painting. Toledo was stunning– we were taught about the history of the city, while exploring the cathedrals, synagogues, and the streets. During our free time, Alyssa and I stumbled upon gorgeous views overlooking the countryside. 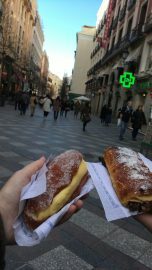 When we got back to the hotel we went to the market near the Plaza Mayor for lunch! We both had paella and I got a tapa with mozzarella cheese, jamón serrano, and jam on bread (can you tell that I am loving the food here?). Visiting the Reina Sofía museum has been the highlight of my time in Spain so far. As I said earlier, I love Spanish art, and the Reina Sofía holds many paintings of Picasso, Dalí, and Miró. For years, I have been looking forward to seeing Guernica, Pablo Picasso’s obra maestra. This is one of my favorite paintings, and I don’t even have words to describe how it felt to finally see it in person. No picture can truly capture how large the painting is– I stood in front of it for 20 minutes just taking it all in. It’s only been two days, and I don’t think the culture shock has hit me yet, but I also don’t know what to expect that to feel like! Tomorrow we will be going to Salamanca which will be my home until June, and I am very ready to be settled in. My nervousness from a few days ago has melted away, and I have a renewed excitement for the rest of this semester. Well, folks I made it to Roma! 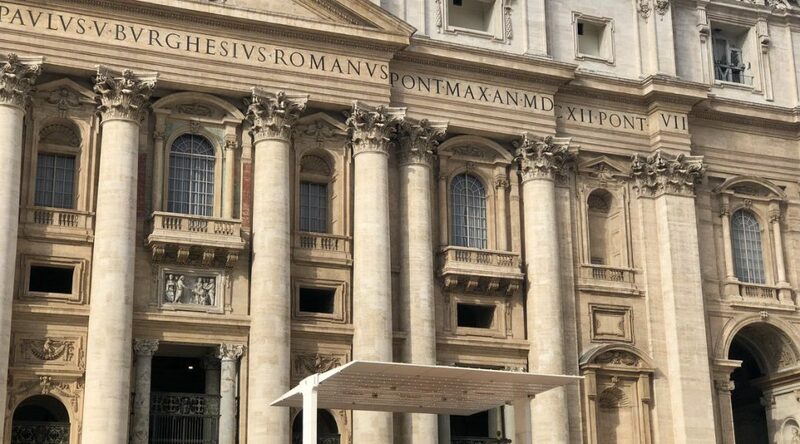 After a quick jaunt across the Atlantic Ocean, a connecting flight in Zurich, and a bus ride through Roma, I finally made it to the John Felice Rome Center. It’s odd to think that this campus and the Eternal City will be my home for the next four months, but I feel at home already! The first few days was Orientation, and it was a whirlwind of information, walking tours, and gelato. The SLAs worked tirelessly to help acquaint the Spring 2018 students with the JFRC, life in Rome, and traveling across Europe. On the first night, I went with a group led by SLA Ola to Old Bridge Gelato which was across the street from the Musei Vaticani. The first gelato of this trip was the best by far–I had un cono di limone e fragola and it was life changing! Afterwards, we walked around La Piazza San Pietro and saw La Basilica San Pietro lit up at night, it was a beautiful sight. On Friday, the SLAs took us to their favorite Roman ristorante or trattoria. SLA Judy took the group to Il Ciocario for one of the best meals I have ever had in my life! The three course meal consisted of a charcuterie & cheese plate, rigatone all’amatriciana served out of a cheese wheel, and tiramisu. Yes, a cheese wheel. Again, it was life changing. Saturday morning, Dr. Evers gave an abridged (and inspired) history of Il Foro Romano and Il Colosseo before we headed out to tour the historic sites. It was my second time at Il Colosseo and Il Foro Romano, so I played tour guide (shh, I am not licensed!) and led the group to all of the best spots. Seeing Il Colosseo right when the sun was starting to go down was a sight I will never forget. The way the light played off the ancient walls was magical, and you couldn’t help but wonder what it was like to go to Il Colosseo at its peak. I could do without the violent gladiator games, though. Afterwards we walked across the street to visit Il Foro Romano during golden hour. Our group stopped constantly to take pictures of the sights and of each other because the lighting was unbelievable–I took maybe 200 pictures that day. 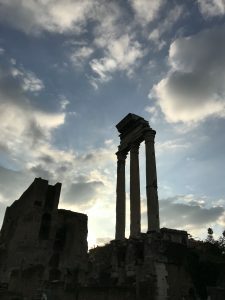 Seeing the ancient ruins was a treat that afternoon, because the sun was going down and the air was starting to cool, it almost felt like we were in Ancient Roma strolling through the Forum. Again, what I would do to see Il Foro Romano in its full glory and all of the buildings intact! Going to school on Monday was a reality check after spending days exploring la città eterna and eating gelato. It was nice to get a routine in place and have some structure to my days, but I was itching to get back into the city and walk around. On Tuesday, I walked down Monte Mario with two friends, and let’s just say that the Italians have a very different definition of sidewalk than Americans. We walked single file on a tiny strip of asphalt with cars and Vespas whizzing past us down the mountain, and it was a little precarious to say the least! We treated ourselves to gelato after the trek down the mountain, and I ordered for the group in Italian. I have found that in class I can speak Italian fairly well, but once I am speaking with a native speaker, my confidence in my ability to speak disappears! 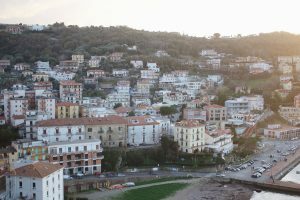 This past weekend was the Orientation trip to Campania, Italy. We spent the weekend touring castles and monasteries, eating fresh mozzarella di bufalo and tasting olive oil + wine. It was a rough weekend. On the second day was our trip to the mozzarella di bufalo farm, where we toured the organic farm and watched how mozzarella is made! It was magical. After the tour of the farm, we went to a winery and sampled wine and olive oil. I am not kidding when I say it was the best olive oil I have ever had in my life! 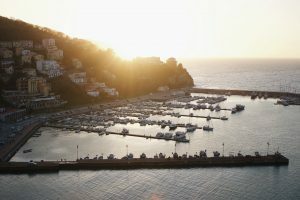 Later that evening, we stopped by the old city center of Agropoli at golden hour. Even though I stepped in a massive pile of dog poop (look down, look down!) it was an unforgettable experience! We spent an hour or so just taking in the sunset and reveling in the fact that we get to call this beautiful country home for the next few months. That night we had dinner at the hotel, which was followed by traditional Italian dancing. The band and dancers sure knew how to party, because they got everyone out of their seats and taught us two different types of traditional dances. Once everyone got the hang of the steps, the laughter was infectious as we swirled through the hotel ballroom. Hopefully I can remember the dance moves! All in all, the first week and a half of my Roman experience has been enjoyable. Though the homesickness is palpable, everyone here is feeling the same way. We all do our best to help cheer each other up and remind them that we are living in the most beautiful city in the world, so there’s no need for tears! I have also found that the FOMO is real. I want to go out and explore every night, but also I need my sleep. Even when in Rome, self care is important. Getting as much sleep as possible and staying hydrated has helped me immensely as I got accustomed to the time difference and culture shock. 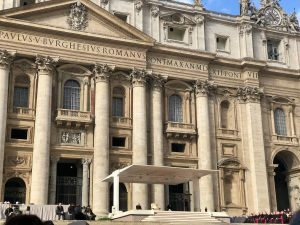 Even though settling in has been a little rough, I remind myself that I am in Rome and I am about to have the time of my life here. There is just so much to do! Follow me on Instagram @quando.a.roma to get hourly/daily/weekly updates on my travels! It is 9:40 pm here in Santiago, Chile and I am sitting at my desk with my window wide open enjoying the summer breeze while the sun is setting. Chile is currently in their hottest months of the year down here in the southern hemisphere which means it is the best time to explore! 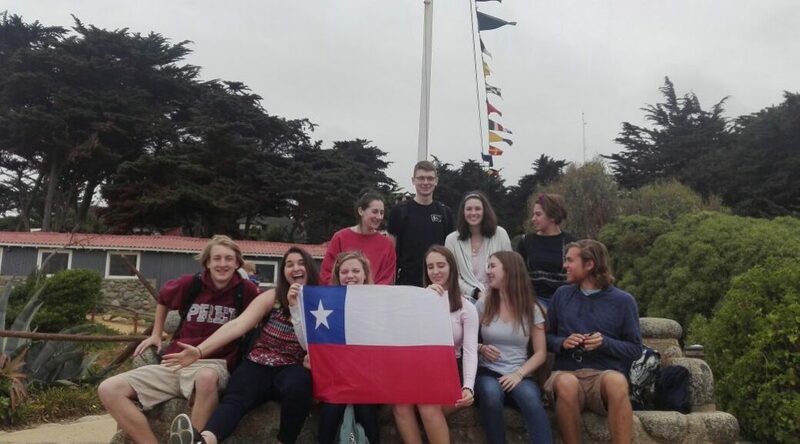 So far my classmates and I have done some pretty cool things in and outside of the city, including hiking, walking through the public markets, exploring art museums and parks but one of the most interesting was visiting the house of Pablo Neruda on the coast of Isla Negra. 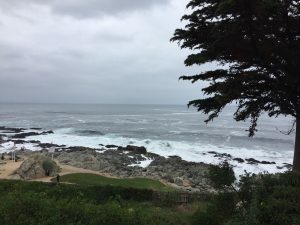 This trip took about a 2 hour bus ride where we drove through beautiful vineyards and mountains upon mountains upon mountains until we got to this charming town on the pacific coast of Chile. 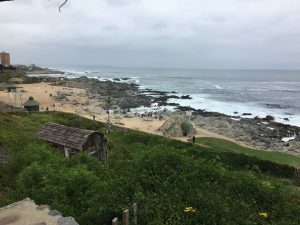 Pablo Neruda had multiple homes in Chile, but the one in Isla Negra was absolutely breathtaking. Unfortunately we were prohibited from taking photos inside the house, but it was covered with incredible statues of mermaids and other sea-like creatures coming out of the walls. Additionally, Pablo Neruda had quite the extensive butterfly and insect collection on display in one of the many rooms of his home. The insects that were incased were mostly indigenous to South America, and most of them I had never seen or heard of before but they were about as big as my hand! 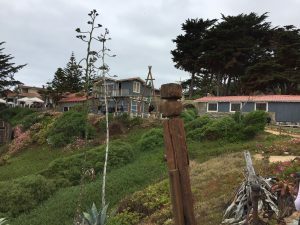 But the inside of the home was not the only beautiful sight to be seen, as his home sits on beach of the”wild coast of La Isla Negra,” as Neruda once described it in a poem. 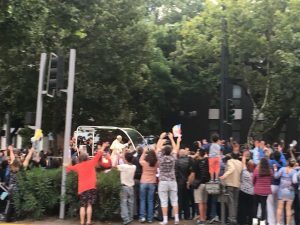 However, the best (although temporary) attraction that Santiago has had to offer yet is, THE POPE! 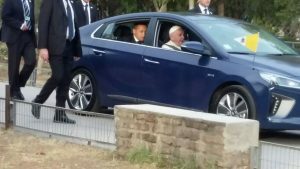 El papa Francisco, as he is referred to as in Chile, came for a short three day visit to Santiago, and many of us were fortunate enough to see him drive by! Ciao! It’s almost two weeks since I arrived at the John Felice Rome Center, yet it already feels like home. The students here, both from Loyola University Chicago and other universities, are open and eager to meet as many people as possible and to engage in genuine conversation. And Rome is even more beautiful, fascinating, and stunning that I imagined it. 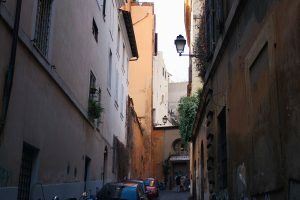 I traveled into downtown Rome on the first night for gelato, to see the Fontana di Trevi, and to wander along the cobblestone streets. 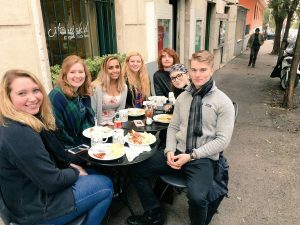 The following night consisted of a community dinner at the SLA’s (Student Life Assistants) favorite restaurants in Trastevere, a bohemian, colorful, and lively neighborhood. 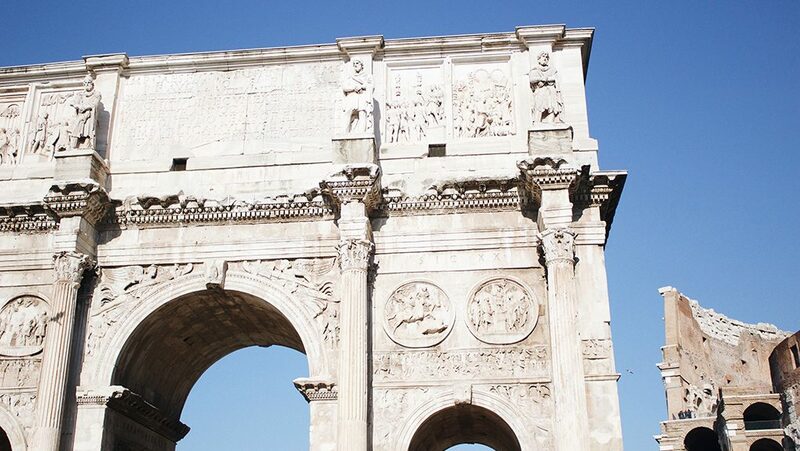 On Saturday we visited the Colosseum, which was massive, stunning, and magnificent, and then the Roman Forum, which was originally a marketplace, as well as a political and religious center. 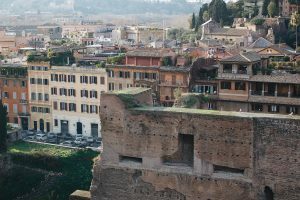 We made our way up to the highest lookout, Palatine Hill, and saw the sprawling city below us in the golden afternoon light. We then had several hours to explore Rome in the daylight for the first time. 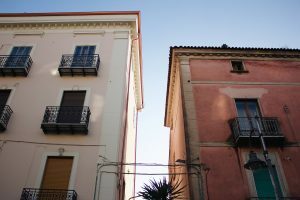 We meandered through the streets, admiring the pale yellow, pink, and orange buildings and the lights strung above us. Each alley was home to cozy restaurants and warm cafes and I could have spent days just in that area. We eventually settled on a restaurant and ate the best bruschetta I’ve ever tasted. On Sunday we had an orientation day trip to the town of Caprarola and toured Villa Farnese, a mansion in Viterbo, Northern Lazio. 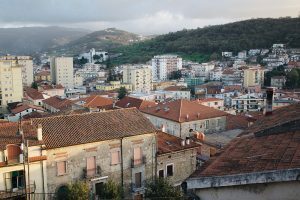 It sat at the top of the town and the hills were stacked with charming houses, fresh linens swaying from every balcony and window. 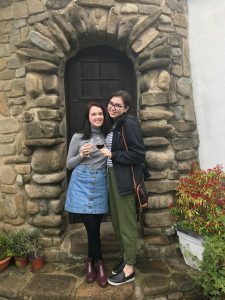 We ate lunch in a rustic modern restaurant and I had the most delicious vegan meal – warm salty bread with olive oil and olive tapenade, polenta, pasta with broccoli and olive oil, perfectly seasoned chickpeas and potatoes, and vanilla ice cream swirled with strawberry. I had classes Monday through Thursday, Italian 101, Ethics, Christianity through Time, and Women in Literature. All of my professors are welcoming, personable, and incredibly knowledgable and passionate. 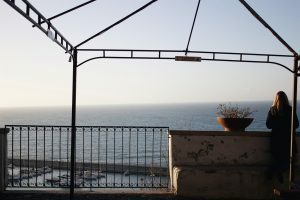 I went for a run one morning and found a scenic overlook in the neighborhood, Balduina and visited a Picasso exhibit downtown one evening that displayed the work he created while living in Rome. A group of us ate dinner outside surrounded by ivy and heaters at Taverna Trilussa, and it was stunning and delicious but we learned the unforunate lesson that customers are charged for the bread that the waiters continuously bring to the table. You also always need to ask for the check, as the waiter will never assume that you are finished and ready to leave. We finished the night up with gelato, the perfect ending to any great day. The second weekend was our orientation trip to Campania, a region in southwestern Italy known for its dramatic coastline and ancient ruins. We visited and toured the Reggia di Caserta and the Museo e dell’ Abbazia, had a wine and olive oil tasting, toured a buffalo farm, explored Agropoli, ate elaborate and 4 course lunches and meals, and learned northern Italian dances. It was the last time until the end of the semester where all students and faculty would be together and a special bonding experience. After a speech from the Dean of Students, I became emotional about leaving in May, because in the short time I’ve been here I’ve already grown and experienced so much. I am beyond ecstatic for the rest of the semester, but I hope that time passes as slowly as possible, to soak up and enjoy every moment of it.